One of the most beautiful mosques in Turkmenistan is the mosque Ertogrulgazy or Mosque Azadi. It is the largest mosque in the city, built in the Turkish style. The mosque consists of four minarets, the first of which was built in the early 1990, after the independence of Turkmenistan. This monumental building, named in honor of Ottoman Sultan Ertogrul, for the first time was opened in 1998. The building external appearance has many similarities with Istanbul's Blue Mosque. The building was built by means of the Turkish Republic. There was no one mosque in Ashgabat until 1991. So Ertogrulgazy mosque became one of the first mosques in the Turkmen capital. As mentioned above, the architecture of the mosque is not typical for Central Asia. There are the Byzantine and Islamic styles of architecture. Ertogrulgazy mosque is a true spiritual center for the believers in Ashgabat. It is important to note that there is Mufti’s device of Turkmenistan. Now it is headed by Mufti M. Akyev. There is a courtyard with a fountain inside this magnificent building. The room for believers is decorated with beautiful paintings. 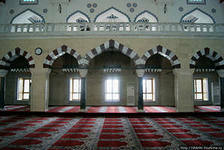 Ertogrulgazy mosque is visited by thousand faithful every Friday and public holidays of Turkmenistan.